From the best-selling author with more than 1 million devotionals sold comes this 365-day devotional with journaling space for every day of the year. With its deluxe slipcase, it is ready for any gift-giving occasion. peace on each page, and use the lined space for your response. 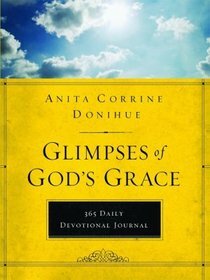 About "Journal: Glimpses of God's Grace"
Anita Corrine Donihue is a writer, teacher, and pastor's wife in Washington whose books have sold more than one million copies. She and her husband, Bob, have five grown sons.